4 BEDROOM, kitchen, 3 bathrooms, kl. Sauna, terrace, f. 10 people max, dogs welcome! Price per night per adult depending on the season between 15 and 35 euros. Children under 6 are welcome to travel with us at no extra charge, children between 6 and 12 pay only 10 euros per night. Four-legged friends? No problem, even your furry family members are welcome! In addition, there is a one time cleaning fee of 50 €. All other additional costs - electricity, garbage, water, heating, use of bed linen and towels - are already included in the rental price! Our house is a real unique. Originally built in 1899 and used as a joinery, it was renovated in 2011 lovingly and faithfully. Here, the typical of our rural region has been put into a comfortable state with careful conversion measures. The characterizing house with its original character is a gem. 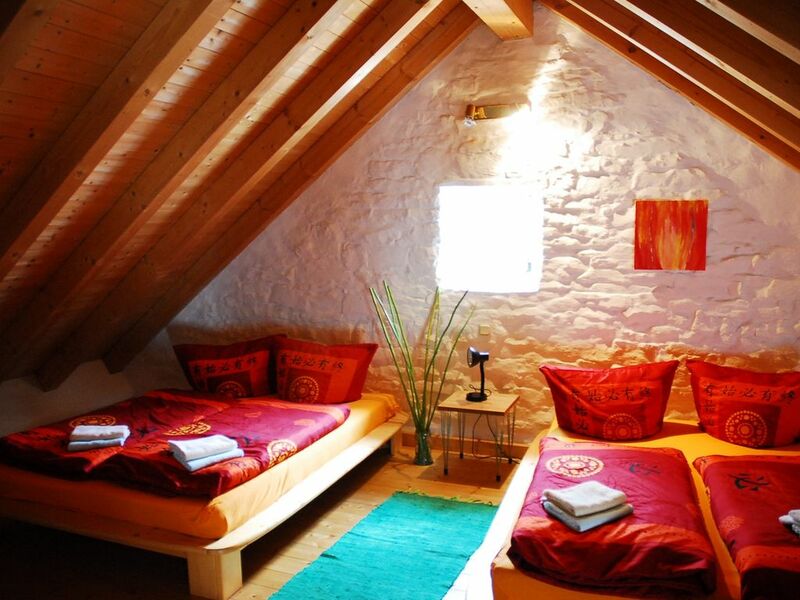 If you want to enjoy a holiday in the Eifel, here is stylish reserved. The house is a listed building. There is no need for comfort: 150sqm has four bedrooms with capacity for 10 people (maximum 11 people with extra bed), three bathrooms, two with shower and one with bath, a kitchen (fully equipped) and a living room. There is also a small sauna in one of the rooms. The house also has a spacious terrace with barbecue area. There are two ball grills for you, as well as a nice seating area with a large table. The house is located in a quiet side street, just a few steps from the Kyll. Bedroom: The house has four great bedrooms, one with bunk beds, two with a double bed and a large gallery bedroom with two double beds and a sofa bed for 2 persons. Each room has mirrors and the ability to store personal items. Bed linen and towels are provided of course. There are two bedrooms each on the 1st floor. OG and two in the 2. OG. Each floor has its own bathroom. Bathrooms: Each floor has its own bathroom. On the 1st floor there is a bathroom with bathtub, there is also a small sauna. In the EC and 2. OG are each a bathroom with shower. Towels are of course provided. The living room is equipped with a very spacious, new couch. From there you can look at a new flat screen TV, which provides entertainment. In the open dining area there is a large dining table. Kitchen & Terrace: The house has a fully equipped kitchen with cutlery and crockery, glasses, toaster, coffee machines (filter and PAD machine, Tassimo), thermos, washing machine, dryer, stove, bread slicer, hand blender and refrigerator. Even the most necessary spices utensils and kitchen roll etc. is available, as well as cooking utensils and dishes. Outside there is a nice terrace with barbecue and seating. In addition, we have a 2-person sauna. Birresborn is an idyllic Eifelort with very good train connection to Trier and Cologne and great infrastructure. The river that passes through Birresborn is called 'Kyll' and is a 2-minute walk from the house. A paradise for anglers! There are bakeries, a butcher, shopping opportunities - all within a few minutes walk. In addition, Birresborn has a beautiful Eifelradweg, very good restaurants and a beer garden. From Birresborn you can reach Gerolstein, Prüm and Bitburg in 10-15 minutes. Luxembourg and Belgium are around the corner. Trier, Koblenz and Cologne can be reached within an hour.